Born in Jamaica, Nari Ward burst on the international art scene in 1993 with a DIY installation of hundreds of discarded baby strollers in an abandoned Harlem firehouse, garnering critical acclaim. Since then, he has consistently shown a knack for transforming found objects into poetically and politically resonant artworks. 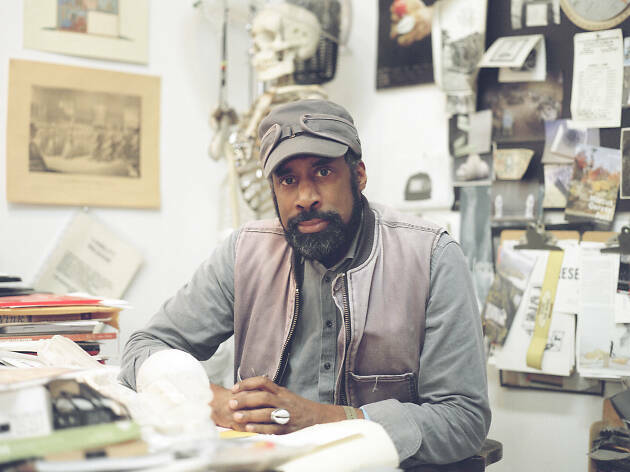 Now the subject of a New Museum retrospective, Ward recently sat down in his Harlem studio to discuss race, recycling and whether his work conveys a message. Do you associate your work with the discussion surrounding the African diaspora? Definitely. I think that discourse revolves around the notion of connectedness—where you’re connected to, how you’re connected and who decides what those connections mean in terms of race, gender and popular culture. The questioning of those things is part of my mission as an artist. Your practice is also about Harlem, where you live and work. How did you wind up there? I started living in Harlem during the 1990s, when the city was struggling with AIDS and the crack epidemic. There was something dynamic about the situation—the abandoned buildings and the sense that New York was experiencing a critical moment. That’s when I started working with things I found on the street. Would say you are practicing an art of salvation in terms of recycling and spirituality? There’s a bit of both. Endemic to folk art is the notion that there’s a material transformation and a spiritual one, an attempt to negotiate both of those things and sort of dance with them. I guess I’m doing the same. Your New Museum show is titled “We the People,” which is also the name of your installation that uses shoelaces to spell out the first words of the Constitution. What does it say about your view of America? I wasn’t thinking about America as much as about how to make the idea of “the people” about form and movement. I’ve done other shoelace pieces, and they are all about lift, about weightlessness and movement. America as an experiment in uplift is what I wanted to express. Does your art have a message? Well, I don’t want to be the crazy guy screaming on someone’s lawn. I want to be the guy who comes in and plugs up the toilet, creating havoc in a different way. 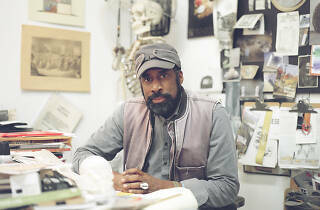 “Nari Ward: We the People” is at the New Museum from Wed 13 to May 26 (newmuseum.org).